There are a large number of applications of photo- diodes. However, we shall give two applications of photo-diodes by way of illustration. (i) Alarm circuit using photo-diode. The Below Fig. shows the use of photo-diode in an alarm system. 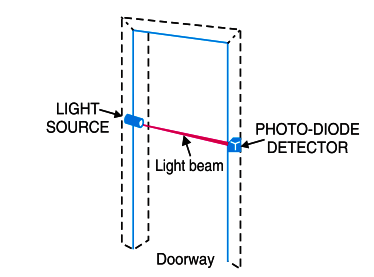 Light from a light source is allowed to fall on a photo-diode fitted in the doorway. The reverse current IR will continue to flow so long as the light beam is not broken. If a person passes through the door, light beam is broken and the reverse current drops to the dark current level. As a result, an alarm is sounded. (ii) Counter circuit using photo-diode. 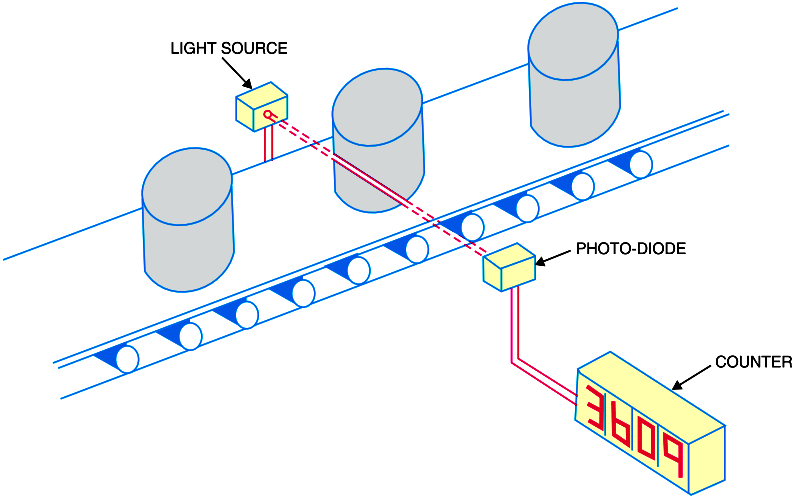 A photo- diode may be used to count items on a conveyor belt, Below Fig. shows a photo-diode circuit used in a system that counts objects as they pass by on a conveyor. In this circuit, a source of light sends a concentrated beam of light across a conveyor to a photo-diode. As the object passes, the light beam is broken, IR drops to the dark current level and the count is increased by one.